THADDEUS EZRA SANGER, M. D. The medical profession is ably represented in Grafton Co. by many physicians of both the old and new schools, who reflect great credit on their respective systems, but the oldest and without doubt the ablest exponent of the homeopathic school in the county and in the State north of Lake Village, is the learned and cultured gentleman whose name heads this short memoir, Dr. Thaddeus Ezra Sanger, of the village of Littleton, N. H. He has been engaged in the active practice of his profession for the past forty years, in all of which period he has been identified with Littleton, with the exception of two years spent in Hardwick, Vt. He became a student and a successful practitioner at a time when the school, with which he allied himself, was held in great disfavor and contempt by members of the so called regular school; Dr. Sanger has been of vast service in bringing the tenets and principles of his school into popular favor both in the district in which he lived and generally throughout Northern New Hampshire and Vermont. Our subject was born in Troy, Vt., March 12, 1832, and is a son of Ezra and Sarah M. (Brown) Sanger, and a grandson of Eleazer and Sabrina (Whitney) Sanger. Eleazer Sanger, our subject’s grandfather, was the third of that name, and a son of Eleazer Sanger, the second, born in Petersham, Mass., in 1735, who, with his brothers, Ezra and Abner, was at the taking of Quebec and Fort Ticonderoga during the French and Indian War; they were also members of the foot company from Keene, N. H, which marched on the alarm, given at Bunker Hill in the Revolution. Eleazer Sanger, the first, father of Eleazer, the second, and great-great-grandfather of our subject, was born in Sherburn, Sanger, in 1651, and grandson of Richard Sanger, the second, who was born in London, England, in 1620, and came to America and settled in Sudbury, Mass. Richard Sanger, the first of that name, was born in England, emigrated to America, and settled in Kingham, Mass., in 1636. Dr. Sanger’s grandfather was born in Keene, N. H, in 1766, and joined in marriage to his estimable wife, Sabrina Whitney, in Winchester, Mass. ; after marriage, about the year 1790, he set out on his journey with oxen and sled to found a home in Vermont, at a locality he had previously picked out as suitable. He purchased a tract of land, since incorporated in the town of St. Johnsbury, where he cleared a piece for immediate cultivation and erected a log-house, at what was known as the four corners; later on he settled in the center, where he built mills, and engaged in sawing timber info lumber. He was a typical pioneer and owned and cleared about 200 acres of forest land. The village, which soon gathered itself about the mills, formerly called the Center Village, and now St. Johnsbury, was known as Sanger’s Mills as late as the year 1848. Hospitable and accommodating of nature, he often entertained teamsters and travelers coming his way in the spacious and roomy Hopperroofed house, which he built in the village, but which he never opened as a tavern. He was a very prominent man in business and took a lively interest in any contemplated improvement of the village. His death, which took place at the age of seventy, was mourned by not only those of his own generation and years, but also by all who had ever known him in either business or social circles. His wife passed away in obedience to the heavenly summons at the age of seventy-five, in 1838. Twelve children were born to them; among those who grew up to maturity were the following: Ezra, Betsey, Sabrina, and Lydia. 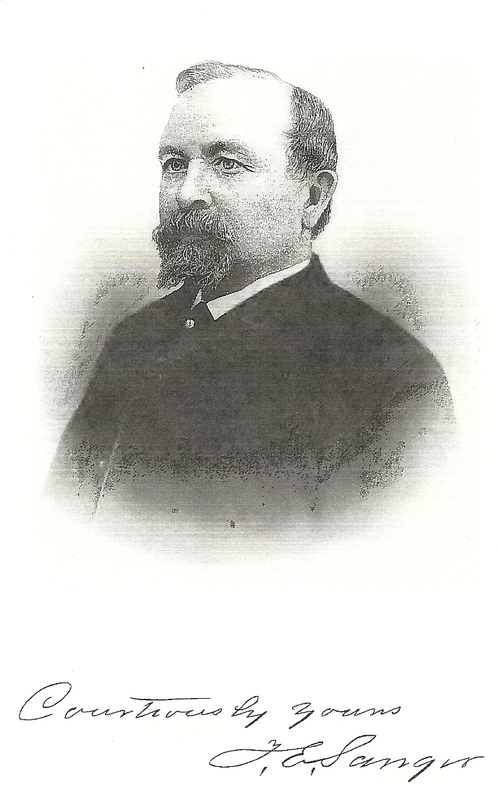 Ezra Sanger, our subject’s father, was born in St. Johnsbury, Vt, in 1804, and when a young man entered the store of John Clark as his clerk, and later opened a store of his own in the Center Village as the first merchant of the village. Upon his removal to Troy, Vt., he sold his business and entered upon the manufacture of potash and shoes in his new home, besides running a store of general merchandise; it was during this period that Dr. Sanger was born. In 1834 Ezra Sanger sold his interests and moved to Honeoye Falls, N. Y., where he identified himself in the mercantile life of that place till his death in 1840 of consumption. His wife, Sarah M. Brown, who was an adopted daughter of John Clark, her parents having died when she was a child, bore Mr. Sanger the following children: Maria, Ellen, Thaddeus E., Mary Ann and Benjamin. Our subject’s mother married as her second husband Thomas Gleason, and was blessed with one child, Fanny; Mrs. Gleason finally departed this life at the age of fifty, with a complaint of lung trouble. Ezra Sanger was a Whig in politics, as was his father before him, but never felt inclined to run for any office. He was liberal in his religious views. Sarah Brown Sanger was a granddaughter of John Ide, who was a soldier in a Massachusetts regiment in the Revolution. Her grandfather on her father’s side, John Brown, was also a soldier of the Revolution. Dr. Sanger’s early education was obtained in the common schools of the town in which he lived; he then entered St. Johnsbury Academy and finished the course at the age of eighteen, going from there to Toledo, Ohio, where he taught school for a time. Soon after he accepted a situation as a clerk in a drug store; there he first applied himself seriously to the study of his profession, and availed himself of every chance moment of time, even breaking in on needed hours for rest to further his knowledge in the theory of the healing art. After two years of well-employed time in the drug store he attended medical lectures in Philadelphia, and then put himself under the direction of Drs. Stone and Sanborn of St. Johnsbury, Vt. He also studied medicine in the office of Dr. Darling at Lyndon, Vt. Backed by his powerful will and assisted in his study by his well-formed trait of perseverance, he made rapid progress, and soon entered the Homeopathic College at Philadelphia, from which he graduated in 1856 and located immediately at Hardwick, Vt., where he remained two years, coming from there to Littleton, July 12, 1858, with a reputation already established. His long and varied practice since in Littleton and its vicinity has developed into one of the best, both from a financial and a professional standpoint. He can claim the distinction of being the first physician of the Homeopathic School in Northern New Hampshire, and what might be termed a pioneer in that system in this section of the State. From the beginning of his professional career he evinced great enthusiasm in his chosen line of work, exhibiting in more than one way his marked fitness as a physician. His reputation as a skillful and generally successful practitioner was readily established and soon brought him to be consulted in critical cases by both members of the allopathic and homeopathic schools; he is frequently called in consultation throughout Northern New Hampshire and Northern Vermont, and sustains a high reputation among the leading members of the medical fraternity in the State. His professional connections have led him to become a member of various medical organizations, in which he has as a rule taken a prominent part. In 1870 he became a member of the American Institution of Homeopathy. Since 1865 he has been a member of the New Hampshire Medical Society, and has held many of the important offices, such as censor for fifteen years, vice-president in 1876-77, president for the years 1878-79-80. The honorary degree of “Doctor of Homeopathic Medicine” was bestowed upon him in 1867, in recognition of his ability and services. In 1871 he was appointed by the general Government to the position of pension surgeon for the United States Pension Bureau, and held that post until the advent of Cleveland’s Administration, when he resigned. It was mainly due to his energetic efforts that the Connecticut Valley Homeopathic Medical Society of Northern New Hampshire was organized; he was elected to the office of its president for two years. At the present time he is medical examiner for the Knights of Honor and the Provident Mutual Association of New Hampshire. Free Masonry has claimed much of his time and attention, not otherwise devoted to his profession; he joined the Burns Lodge at Littleton, Dec. 7, 1870; received the Chapter Degree, Franklin Chapter of Lisbon, in 1881; was made Knight Templar of the St. Girard Commandery, Jan. 23, 1882; took Council degrees at Omega Council, Plymouth, Feb. 11, 1884; and received the thirty-second degree of the Scottish Rite at the Valley of Nashua, Dec. 21, 1885. He has held in the past and still holds important Masonic offices. In 1871 he was Junior Warden, Senior Warden in 1872-73, Warder of the Commandery in 1882, Captain-General in 1883, Eminent Commander from 1884 to 1891, Grand Captain of the Guard of the Grand Commander of the State in 1884, and Grand Warder in 1885. He was Master of the Burns Lodge, F. & A. M., in 1890, and Grand Commander of the State in 1892. The remarkable success with which Dr. Sanger has met is a good index of what can be achieved by pursuing a definite aim in life. Distinction and an honored name have come to him by reason of his natural talents, his even and genial temper, and a life unremitting in its application to the work he took in hand. The first five years of his medical experience was not altogether calm sailing, but he established in that time a character for his system from an adverse starting point, and a place for himself as a physician and as a surgeon, worthy of the highest commendation. He is conceded to be an authority for the Homeopathic School in Northern New Hampshire. His admirable personal qualities have attached to him a large and respectable body of adherents. In his battles with human ills and infirmities he is cool and sagacious and most persistent in his belief in the dogma of his school-like cures like. His earnestness and evident sincerity, combined with successful results, have inspired a confidence in the worth of homeopathy, and have converted many to his faith, and under this inspiration he now enjoys a lucrative and satisfactory practice, as he has done from the early days of his professional career. His quick and brilliant intellect, his clearness of perception, his ready wit and repartee, his unvarying good nature and fine conversational powers make him a general favorite among all classes, and a welcome guest at the fireside and in the social circle. Dr. Sanger was joined in the holy bond of marriage, Oct. 29, 1856, to Miss Ianthe C. Kneeland, daughter of Willard Hall and Clara (Woods) Kneeland of Victory, Vt. Mr. Kneeland was for many years a prominent farmer of that town and of the town of Waterbury, and owned valuable lumber mills, but on his retirement he moved to Littleton, N. H, where he died in 1875, at the age of seventy, having been born in Waterbury in 1805. His wife, who was born in Barnet, Vt, in 1810, departed this life in 1892. She was a granddaughter of Capt. John Ide, who served in Rhode Island in the Revolution, and granddaughter of John Woods, who served in New Hampshire and Massachusetts during the same war. There were born to Mr. and Mrs. Kneeland four children: Samuel P., Ianthe C, Ellen, and Ireneus. Willard H. Kneeland was a son of Richard Kneeland, the second, who was born in Westford, Mass.,- in 1778, grandson of Richard Kneeland, the first, born in Boston in 1752, and great-grandson of John Kneeland, the fifth, who was born in Boston in 1694. This John Kneeland was the celebrated Boston builder and real estate owner after whom Kneeland Street and Kneeland Wharf were named, and who constructed the ever-memorable “Old South Church” in Boston. John Kneeland was the son of John Kneeland, the fourth, who was born in Boston in 1668, grandson of John Kneeland, the third, born in Boston in 1632, great-grandson of John Kneeland, the second, born in Scotland in 1600. He came to America in 1632 and settled in Boston. He was a son of Capt. John Kneeland, the first, who was born in Scotland in 1565, married Mary Dunbar in 1598, and died at sea in 1635. Of our subject’s children Ellen I. is the eldest and was born Dec. 22, 1866, and is an artist by profession. She attended the Normal Art School at Boston, and has taught industrial drawing at Littleton, where her natural talent is highly appreciated. Lillian E., born April 20, 1872, became an accomplished musician, and married F. E. Green of Littleton, N. H. Catherine F. was born April 7, 1879. Dr. Sanger has dealt considerably in real estate, buying property, and, after making valuable improvements, selling at an advantage to himself. His first home was at the corner of South and Cottage Streets; after living there for a number of years he sold it and bought the Truman Stevens place on Main Street, in 1873. The location was one of the finest in the village, but the house was antiquated and in bad repair, so Dr. Sanger caused it to be taken down and a large house with mansard roof to be erected in its stead. Barns were also built to accommodate the horses and cattle, and the large lot was transformed into beautiful lawns with many fine shade trees. His office is located in his home, so that everything is convenient for a comfortable practice of his profession. It affords us the greatest pleasure to present the portrait of Dr. Sanger in connection with this sketch of his life as a prominent and representative physician and as a pioneer of the Homeopathic School in Northern New Hampshire.